DESCRIPTION -- From the Furness Bermuda Lines this is a ladies souvenir compact which would have been purchased on board ship during a cruise DURING THE 1950's. It is in a very good condition and from the vessel the SS Ocean Monarch (click on the picture to see the design and name on the front). HISTORY -- The SS Ocean Monarch was built in 1951. After 15 years of regular cruising between New York and Bermuda she was laid up, but sold to Bulgaria in 1967. In 1979 she was sold to Greek interests. During the final stages of refitting in 1981 she caught fire and sank. DESCRIPTION -- Souvenir decorative dish from the British India Steam Navigation Company ship the SS Nevasa which shows on it the destinations and ports of call for a cruise on board the vessel. Great condition and the size is 4Ãƒâ€šÃ‚Â½" (11cm) wide. HISTORY -- The third Nevasa was built for BI in 1956 as a troopship under government specifications. She was followed by her near sister, the Oxfordshire, built for the Bibby Line in 1957. These two ships were the largest troopships built in the UK and set new standards for the comfort of their passengers. DESCRIPTION -- Celebration tie from the shipping company the Canadian Pacific Line. It celebrates 75 years of service in the North Atlantic and from 1903Â¬1978. The tie is in an excellent condition. HISTORY -- CP Ships was a large Canadian shipping company established in the 19th century. From the late 1880s until after World War II, the company was Canada's largest operator of Atlantic and Pacific steamships. Many immigrants travelled on CP ships from Europe to Canada. The sinking of the steamship RMS Empress of Ireland was the largest maritime disaster in Canadian history. The company provided Canadian Merchant Navy vessels in World Wars I and II. Twelve vessels were lost due to enemy action in World War II including the largest ship sunk by a German U-Boat. DESCRIPTION -- Company tie originating from the Turnbull Scott Shipping Line which is in an excellent condition and dates from the design of the 1950's (click on the picture to see a close up of the design). HISTORY -- Although originating in Whitby, Reginald Turnbull and Robert Scott entered ship owning in London in 1882. The company were mostly concerned in tramping work, but also had a steady grain trade from the River Plate. Two owned ships and one managed ship were lost to enemy action in the 1914-18 war. DESCRIPTION -- Excellent condition as new souvenir mug from the training vessel the TS Royalist. HISTORY -- TS Royalistis the name of two vessels. The original was a brig launched in 1971 and owned and operated as a sail training ship by the Marine Society & Sea Cadets of the United Kingdom. At the end of her service she was replaced by a new vessel bearing the same name. 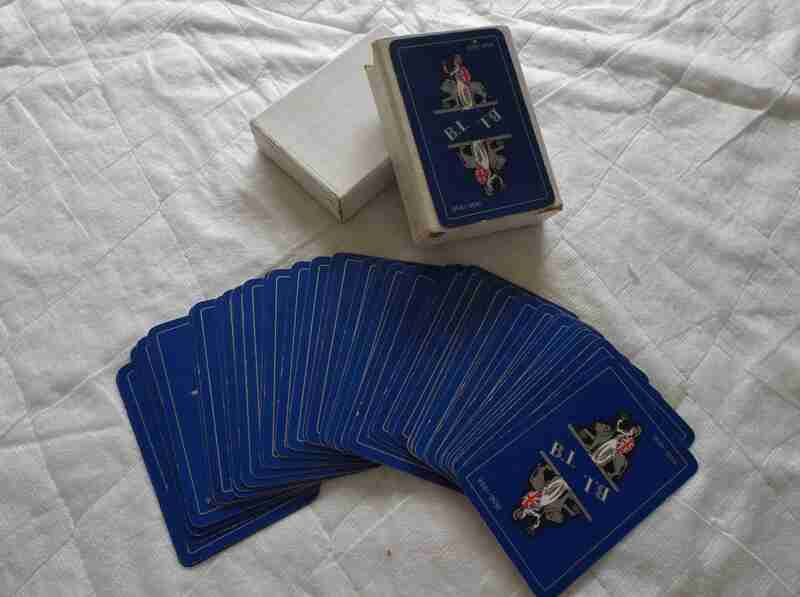 DESCRIPTION -- Pack of souvenir playing cards from the Lamport Holt Line shipping company limited and they are as new, unopened and in excellent condition and date from the 1950's. HISTORY -- The Lamport and Holt Line was founded in 1845 by W.L. Lamport from Workington and George Holt (brother of Alfred Holt of the Blue Funnel Line). This partnership owned wooden sailing vessels trading with North and South America, South Africa and India. After some tentative involvement with steamers with James Moss & Co., and Papayanni Brothers in the Mediterranean, in the mid-1850s, two 1,300 ton tramp steamers were bought in 1861-1862. 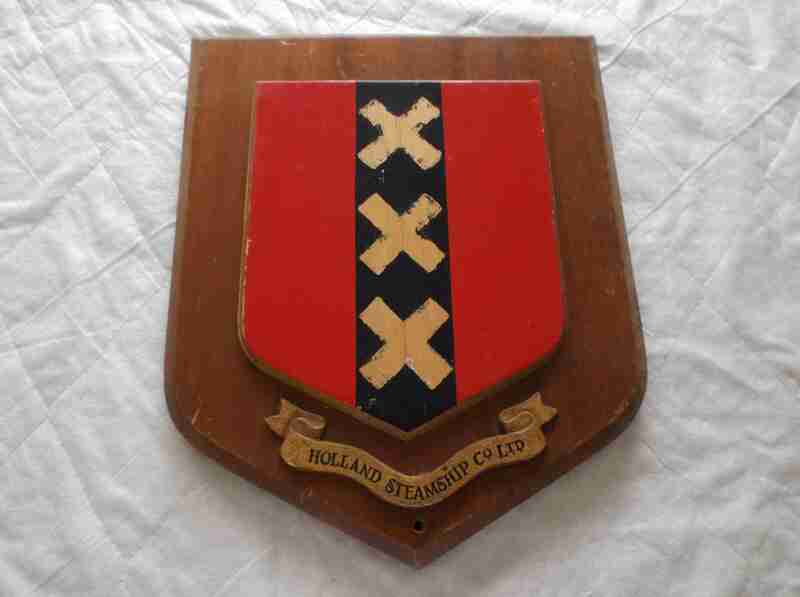 <p>HISTORY -- The Holland Steamship Company(Dutch: Hollandsche Stoomboot Maatschappij (HSM)) was formed in Amsterdam in 1885 to run a steamship service from Amsterdam to London. Outside of its passenger / cargo services, Holland Steamship Company operated cargo services to many ports around the coasts of the U.K. and Ireland - see 'Routes' above. Passengers would occasionally be carried on these vessels but it was on an ad hoc basis. A feature of the ships deployed on the London service was the mounting of deck cranes to facilitate speedy cargo handling. 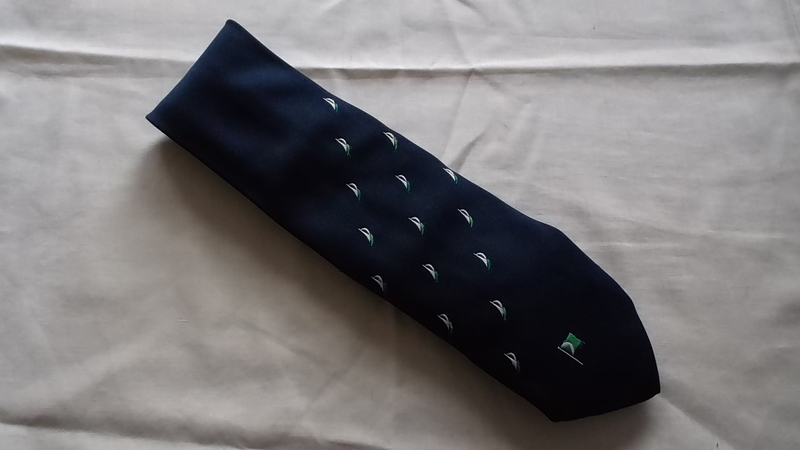 DESCRIPTION -- Company tie originating from the Denholm Line which is produced in blue and is in an excellent condition and dates from the design of the 1970's. HISTORY -- After owning several small sailing vessels from 1872, James and John Denholm purchased their first steamship in 1881. The company entered the deep sea tramping trade at the end of World War I and began an expansion programme. By 1939 Denholms owned nine ships but by 1945 only two of these ships survived. After the war the fleet was rebuilt and later diversified into tankers and ore carriers. With the demise of tramp shipping, the company concentrated on bulk carriers and still operates a fleet of ships. DESCRIPTION -- British India Steam Navigation Company Ltd is a set of souvenir playing cards. They are a full set which is in the original box and date from the 1950/60's and in an excellent condition. HISTORY -- British India Steam Navigation Company ("BI") was formed in 1856 as the Calcutta and Burmah Steam Navigation Company. The company had been formed out of Mackinnon, Mackenzie & Co, a trading partnership of the Scots William Mackinnon and Robert Mackenzie, to carry mail between Calcutta and Rangoon. It became British India SN Co in 1862. Under the hand of Lord Inchcape, who had become chairman in 1913, the company became part of the P&O group of companies in 1914 through a complex amalgamation, but continued with its own identity and organisation for another nearly 60 years until 1972, when it was entirely absorbed into P&O. 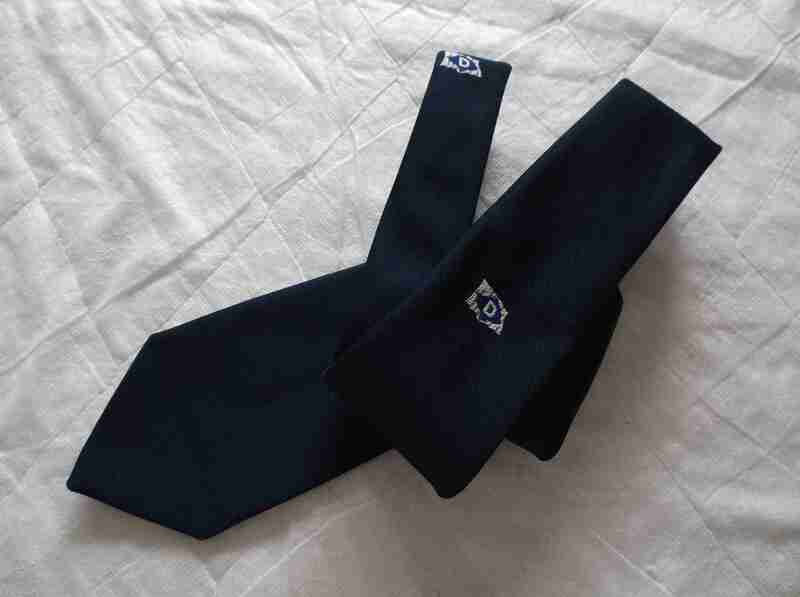 DESCRIPTION -- Company tie originating from the Swedish shipping company Olof Wallenius Lines which is in an excellent condition and dates from the design of the 1960's. HISTORY -- Wallenius Lines is a privately owned Swedish shipping company. The fleet consists of 40 vessels, specializing in transporting cars and trucks worldwide. The fleet is chartered and commercially operated by companies in which Wallenius Lines is a shareholder. The company was founded in 1934 by Olof Wallenius. Olof Wallenius was born in 1902. His first company, Grosshandelsfirman Olof Wallenius, was founded already in 1922 and traded in empty barrels.